MIAMI — Order a steak at Rio Cristal and you may not be able to find it. It’s not that portions are small. In fact, steaks at this venerable Cuban restaurant often cascade beyond the edges of the plate. 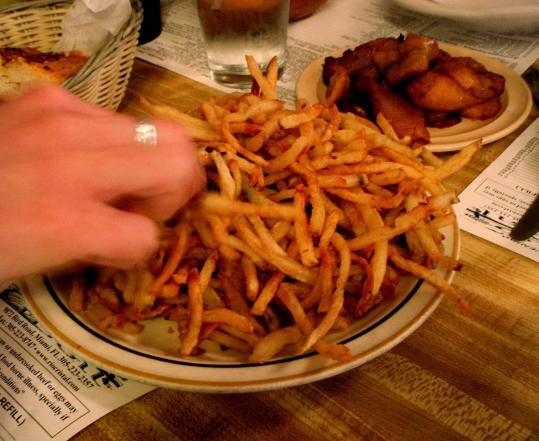 What’s hiding the beef is a mountain of crisp, addictive miniature fries, a signature of the house. The dish is irresistible with a few squirts of lemon juice and hot sauce from the bottles that adorn every table. There are many Cuban restaurants in Miami, but Rio Cristal is one of the oldest and most highly regarded. You’d never know by looking. The modest eatery, now in its 36th year, is in a strip mall, and as Miami has changed around it, the restaurant has stayed the same, offering simple versions of classic dishes such as the medianoche, a sandwich whose name refers to a midnight snack. It combines slightly sweet bread, ham, roast pork, pickles, mayo, and Swiss, and it is ubiquitous in this town. At Rio Cristal it is precisely as it should be — as is nearly everything else on the menu. Rio Cristal’s ropa vieja is a succulent tangle of pulled beef brisket slow cooked in seasoned tomato sauce. The dish is surprisingly delicious for something that translates to “old clothes.’’ Pork, chicken, and fish also abound, as in the trozos de pescado enchilado, tender cubes of snapper served in mild creole sauce. Black beans and rice accompany this and many other dishes. They arrive in separate containers but beg to be combined. The consistency of the beans is close to soup, the liquid thick with savory spices. The rice is richer than any you would dare to make at home, and together the two sides are flavorful and filling enough to make a meal. Sweet plantains called maduros are another popular side. On their own, they are banana candy. In tortilla de maduros, a plantain omelet, the fruity, chewy maduros are surrounded by fluffy eggs. Maduros are made from plantains so ripe that their peels are nearly black, and the fruit is blackened once again when it is seared. Its sugars caramelize and create a delicate, crunchy outer layer. Tostones are made from less ripe plantains and are served as a starchy side that has more in common with a potato than a banana. These work perfectly for sopping up the rich sauces served here. Attentive servers appear to have stepped out of another era, wearing bright blue vests and sporting close-cropped haircuts. Large mirrors and wood paneling cover the walls, along with cheery portraits of rural Cuba; light fixtures bear antiquated floral patterns that lend a grandmotherly aesthetic. The Cuban milkshakes called batidos only come in strawberry, chocolate, and vanilla, rather than the tropical fruit flavors you may be expecting. There’s beer and wine, and Materva, a highly sweetened soda made from yerba mate, the invigorating, murky tea popular throughout South America. Rio Cristal takes its name from another restaurant in the Cuban town of Guines, from which owner Jose Acosta hails. Acosta opened the Miami Rio Cristal after operating a similar restaurant in New York. At 88, he still maintains a presence in the kitchen. There he is joined by his son, also Jose, who learned to replicate his father’s cooking. Acosta’s daughter Ely waits tables. Her mother, Teresita, greets patrons at the door and assists with general management. She is also the person to see if you want to buy a pack of Choward’s Violet Mints from the candy case on your way out. Some customers have been going to Rio Cristal for decades. I’m one. My parents took me there before I could talk. Now visits are less frequent. We still go as a family, snuggle into a booth, dig through the tiny fries, and savor every bite. Yes, the community around this little gem has changed dramatically, but Rio Cristal is always the same. And something about that is very comforting.